I dont think I have seen a better reality show than this. "Sa re ga ma pa Lil Champs 2009" is indeed the best show on air today! 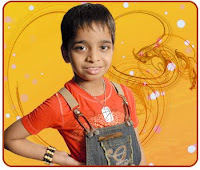 A show where they have brought out the best little champs from the various parts of the country. The kids are too good especially 8 year old Swarit Shukl from Indore. He's outstanding. One of the mentors of the show has christened him as "Kumar Swarit" in lines of "Kumar Gandharv" who started his career at the age of 8. This kid is beyond praises. He is popular not only for his singing but his ability to make notations of any given song at any point of time. Listeners can actually feel that he's cut off from this world the moment he starts singing. He's not only capable of bringing a smile on any face by his comic acts while singing but also touching the hearts of the audience through slow - emotional tracks. I've now become a great fan of this show on air since last 3 months. I make sure that I dont miss any episodes. Watch it once, I bet you cant resist watching it again...! The Zee TV show is aired every Friday & Saturday at 9:30 pm.